On a Russian hillside overlooking the Black Sea sits Baranovka, a tiny town on the outskirts of Sochi. If you climb to the top of the hill, walk down a gravel road and past a construction checkpoint, you'll start hearing the barks. This is Povodog Sochi, perhaps the most publicized of the shelters set up for the stray dogs that athletes and Western journalists were shocked to see running around in packs at the 2014 Winter Olympics. At the beginning of February, this shelter did not exist. Three weeks later, Povodog Sochi boasts 160 dogs -- including at least 20 puppies -- that several athletes, members of the media and other Sochi visitors are hoping to adopt. On Saturday, Povodog opened a new facility built over the past eight days to house even more dogs -- and highlight their long-term commitment to the cause. 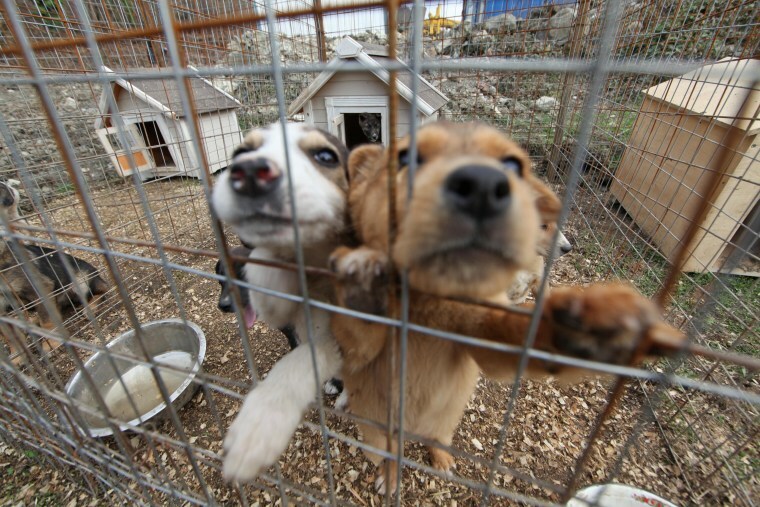 Much of the credit for this endeavor goes to Russian billionaire Oleg Deripaska, who has been funding the shelter since realizing the magnitude of the problem. Deripaska estimates there are nearly 4,000 stray dogs in the Sochi area, which lacks the infrastructure to support all of the potential adoptions. "We realized it was such a big problem and that it was going to make a problem for police and law enforcement to control." "We realized it was such a big problem and that it was going to make a problem for police and law enforcement to control," Deripaska told NBC News. "That’s how we decided that maybe we should intervene and support a program on a larger scale." Stray dogs are not a problem exclusive to Sochi. The World Health Organization estimates the global stray population at approximately 200 million dogs. But the Olympic Games, along with early reports that stray dogs were being euthanized, have brought the dogs of Sochi into the global spotlight -- even leading to some now famous adoptions by Olympians. "I think it's great," Deripaska, who has nine dogs, said of the people taking dogs home with them as the Olympics come to an end. "I may even adopt one myself. I just need to ask my kids what they would choose." For Americans hoping to adopt from Povodog, the organization is still figuring out the details. It is worth noting that the cost to transport dogs can range from $150 to $2,000, based on accommodation and airline. For other questions, check the Centers for Disease Control and Prevention checklist regarding bringing animals into the United States. "Actually getting dogs to America is not as difficult as it might be to another country,” said Nadezhda Mayboroda, director of Povodog Sochi. "But the dog should be older than four months, with rabies shots at least one month before travel and all documents completed." While the adoption process is still in the works, Povodog has set up active social media accounts on Facebook and Twitter, where you can follow their progress.